Dr. Peter W. Kujtan is a family practitioner at the Credit Valley Hospital in Mississauga, Ontario, Canada. He holds a Ph.D. in Medical Science, sits on the Medical Appeals Committee, is a Provincial Coroner, a Member of the Board of Directors at the Community Care Access Centre (CCAC) of the Ontario Ministry of Health and Long-Term Care, and a spokesperson for the Canadian Cancer Society. Previously, he sat on the Halton Peel District Health Council, and was Chairman for Docs On Ice in 2001. Oct. 8, 2005 It's a Canadian Thing! July 30, 2005 What's Left to Privatize? May 14, 2005 Are There Any Herbs That I Should Avoid? Apr. 23, 2005 Whatever Happened to the War on Cancer? Apr. 2, 2005 The Mother of All Diets! Jan. 22, 2005 How Many Potential Toxins Are Found in Your Blood? Jan. 15, 2005 How Often Should I Be Taking Iron Pills? Jan. 8, 2005 When Should I Have My First Mammogram? Jan. 2, 2005 How Is Autism Diagnosed? 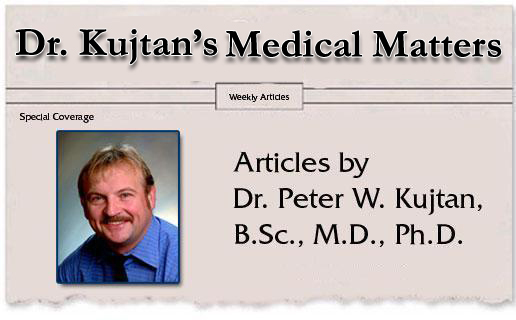 Please note: Dr. Kujtan's articles and related links are provided here as information only. They are not a substitute for medical care provided by your own physician. Articles are edited where needed, and related resources added where appropriate for research purposes.